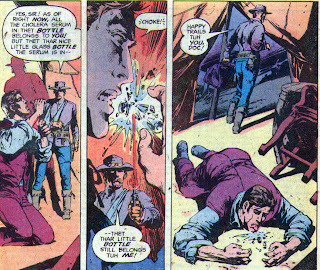 Matching Dragoons: Jonah Hex #26 "Deathrace to Cholera Bend!" 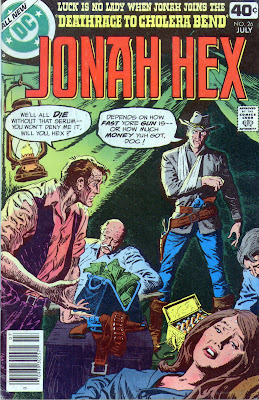 Jonah Hex #26 "Deathrace to Cholera Bend!" Jonah is just a riding along through the high grass in the mountains when he hears gunfire and sees a man on horseback getting gunned down by seven other men. Jonah figgers that it's none of his business, but usually men that shoot other men have a price on their heads. He dismounts and hunkers down in the grass on a ridge and picks off two of the men with his rifle. The rest ride off. Jonah goes down to the scene and finds that the first rider is still alive. With his dying gasp, he explains to Jonah that there is a cholera outbreak at Comanche Bend and the satchel he has contains the serum to cure it. 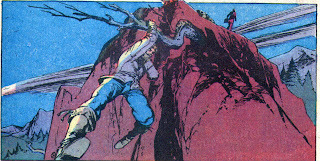 Jonah promises to take it to Comanche Bend and the man dies. Just then another man rides up. He is Roy Jameson, the young medical assistant to Dr. Cranston, the dead man. He explains that they were on their way to Comanche Bend because the flooding of the Gila River had caused a cholera outbreak but his horse got a stone in it's shoe and they got separated while he stopped and dug it out. they were worried that bandits might try to steal the serum in order to sell it to the sick families. Jonah agrees to ride with Jameson. On their way they stop at the Huddleston-Downing stage depot before it gates dark to grab some dinner. When they get there they find the depot boss bound and gagged and three men sitting in the depot. the men start to draw on Jonah and he guns all three of them down. Jonah unties the depot boss but they decide to forgo dinner and makes tracks to the Gila River ferry before the rest of the gang descends on them. When they get to the ferry, the ferry master tells them that the river is too rough to cross. Jameson tries to plead with the ferry master but he declines..right up until a bullet rips through the chest of his partner. He decides that they had better get on their way. As the raft moves out into the river, the ferry master is gunned down. Jonah grabs a pole and starts trying to guide the raft. He shouts at Jameson to help. So Jameson accidentally drops the satchel containing the serum. Jonah quickly ties a rope around his waist, has Jameson tie the other end to the raft, and Jonah dives into the river to grab the serum. Jameson pulls Jonah back on board the raft just in time for the whole shooting match to slam into a huge boulder and splinter into half a gazillion pieces. Jonah's and Jameson's unconscious bodies are washed ashore. Jameson rides into Comanche Bend and sets up shop, selling the serum for $100 a dose (about $1600). The people are outraged but they pay it anyway. That night, after he has sold everything, Jameson starts feeling feverish and realizes that he has cholera!!! Just then Jonah, his arm in a sling, walks in explaining that it took him some time to find a farmer that could dig the bullets out of his shoulder. he also shows that he has one last vial of the serum. He decided to keep some since they were gonna be with sick people. Jameson offers him anything for the serum and Jonah says that he'll take all the money. the deal is struck and Jameson grabs the bottle. Just as he is about to drink it, Jonah says that he sold the serum, not the bottle, and he shoots the bottle to pieces. Jonah picks up the money and walks out as Jameson is left screaming hysterically that he didn't buy the bottle. Timeline - There is nothing to place this anywhere in Jonah's life. The story does span two days. Not a bad issue. I enjoyed the artwork of Cruz having seen a lot of his stuff in the DC 'scary books'. The ending was something that I would have expected from one of those books, so the look fit right in. A similar ending was used before by John Albano. Next Issue - a flashback to Jonah's childhood and how he got his first gun. Well SOMEbody didn't take their Hippocratic Oath very seriously! Didn't buy the bottle eh? Heh. "... picks off two of the men with his rifle." Is this where Jonah says his rifle is a .30-06? A quick peek will reveal what that is and how NOT to place this story in the timeline. Bothorth, good point. I went back and checked the book but Jonah mentions that he will get a chance to try out his new Winchester, which was available. But you have given me a whole new path to chase in regards to the timeline. Sometimes calibers ARE mentioned and I had never thought about tracing the history of the calibers. Thanks for the history lesson and feel free to jump in whenever you fell like it. My other guess was The Rainmaker, where he was also on high ground (I think) with a rifle early in the story. This is really stretching my memory.